Just under half of all Australians will eat chocolate for breakfast this Easter Sunday new research from Woolworths has found. Looking into how Australians will eat this Easter, Woolworths found that around two thirds of Australians will eat Easter chocolate bunnies and half of all Australians will host an egg hunt. 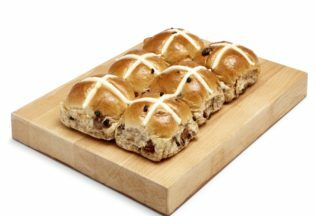 More than 13.8 million Hot Cross Buns will be purchased from Woolworths this week and 80 per cent of Hot Cross Bun eaters will top their buns with butter. Seafood will be popular with Woolworths expecting to sell over 270, 000 kilograms over Australian prawns and 130, 000 kilos of fresh Tasmanian salmon in the week before Easter. Woolworths Supermarkets Managing Director, Claire Peters, said food plays a key role in Easter celebrations every year. “Hot cross buns are a key component and we have some of the best bakers in the country, crafting our specialty range on a daily basis,” Peters said. Around two thirds of Aussies will consume chocolate Easter bunnies, with 88 per cent of those eating the ears first. For most, Easter is all about chocolate, especially for 18-24 year olds who are significantly more likely to be eating Easter chocolate this year (87 per cent) than any other age group. Hollow is the most popular variety of Easter egg (41 per cent), while a little under a third (29 per cent) prefer solid eggs. Almost three quarters of Aussies (74 per cent) who are planning to eat hot cross buns prefer them warm, choosing the microwave as the most popular way to heat them up. Almost a quarter of respondents (23 per cent) eat their buns at room temperature, while three percent prefer to have them cold. Around a third of 18-24 year olds are most likely to eat their hot cross buns whole rather than cut them in half, while 67 per cent prefer them topped with additional ingredients.